Question: Jetting on NC30 and NC35 when using a TYGA-Performance exhaust system? Question: What is the advantage of fitting a TYGA Chamber(s) over the stock? Answer: The stock chambers on most two stroke bikes are both heavy and low in power. This is because of strict laws in Japan or Europe which the manufacturers have to comply to. Many chambers are double skinned for example and have small headers to restrict the flow of gas. By just fitting silencers, you are missing out on optimising the full potential of your bike. The same applies to four stroke systems where the systems are usually heavy and restrictive to pass emission laws. Our systems give more power and weigh a fraction of the original one. Question: Does fitting TYGA pipes mean that my bike will be unreliable? Answer: No of course not. Providing the bike is set up properly and not kept at the red line all the time, it will continue to be reliable. Question: Is rejetting necessary on two stroke systems? Answer: On NSR250s, you can usually keep stock jetting providing you keep the stock airbox. Modifying the airbox and fitting TYGA pipes will mean you should rejet to avoid seizure. we recommend going up one size on the main jets on the Aprilia RS 250. Question: Any specific product recommendations for sealing the headers? For sealing the pipes to the manifolds, Three bond 26B High Temp RTV silicone is a good choice. It's a bit smelly, so use in good ventilation, and let it cure for a few hours (overnight) before starting the bike. Question: Do TYGA performance pipes comply with noise regulations? Anwser: TYGA Performance pipes meet most local and international circuit noise regulations and have been tested at below 105 decibels. The Moto Maggot is a different story though and may not comply. Question: How much power will I get with TYGA Performance pipes? Answer: It depends on your exact bike set up. However, we provide dynographs throughout our website to give you an idea of the gains that can be attained. Each bike and dyno is slightly different, so we can never guarantee a particular output. However, all our comparative dyno testing shows the benefits of fitting TYGA Pipes. Question: How much do the TYGA Performance exhaust systems weigh? Answer: Our two stroke chambers weigh approx. 1.7 to 2.0 kg per chamber and 0.4kg per silencer. Our NC30/35 system weighs a fraction of the stock one. Question: Do I need to cut my fairing to make my TYGA pipes fit? Answer: No, unlike some other systems, this should not be necessary. We endeavour to make all Tyga products compatible with otherwise stock bikes. On the MC21, you may need to reposition the lower right side position of the fairing slightly. Remember to loosen off all brackets and fasteners and adjust bodywork. Always make sure there is clearance around the pipe or it will burn the bodywork. Only a small clearance is necessary to stop heat conduction. Question: Can you help set up my bike with TYGA Performance pipes fitted? Answer: Yes, we will provide you with some base setting to work from and help you set your system up for your particular bike. We can only offer advice via email. 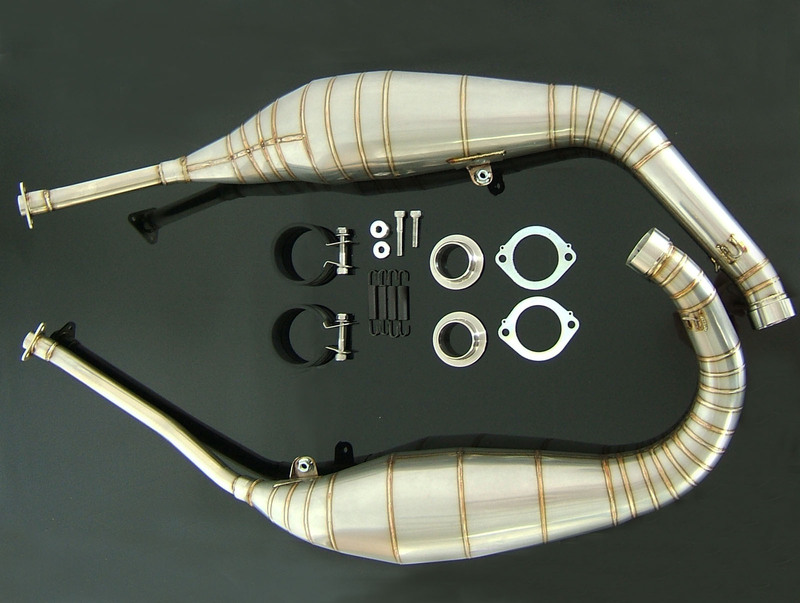 The installation of the exhausts and jetting should be carried out by someone with some mechanical experience and preferably understanding of setting up your model motorcycle so they can tell us of the characteristics of the set up. Question: Do the silencers on my TYGA two stroke system need a bracket? Answer: We do not provide them on all models, though all GP style silencrs have a clamp which joins the two silencers together. If you are doing a very high mileage, the silencers may get shaken until they become loose and you might want to consider additional support. Clamps can be purchased from the website store in the exhaust category for each model. We don't provide brackets on some of our side by side systems because they look ugly and get in the way. Question: Are TYGA silencers rebuildable? Answer: TYGA silencers do indeed have packing in them, and this can be renewed. The procedure is to drill out the rivets holding in the end cap, pull out the end cap and then remove the old packing. Stick in the new packing and then rivet the silencer back together. The splattering with oil on two stroke silencers is more than likely due to over-rich jetting rather than a silencer problem.